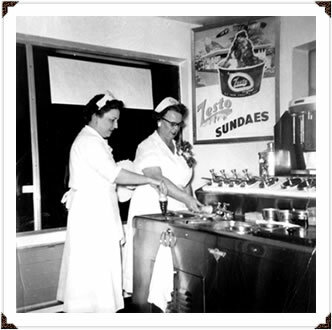 Zesto started in 1945 as a subsidiary of Taylor Freezer Corporation, a Rockton, Illinois company that manufactured soft serve ice cream machines. The machines were called “Zest-O-Mat” and thus the name Zesto. Originally meant to compete with Dairy Queen, Zesto was conceived as an ice cream only store with no other food items. By late 1949 Zestos were operating in 46 states. In 1948, in Columbia, South Carolina, John Livaditis received a franchise for his own Zesto, and was also employed by Taylor to oversee the opening of new stores in the southeastern U.S. In 1949 John opened his first store in Atlanta on Peachtree Road across the street from Brookwood Station. Beginning in the early 1950’s, Taylor Freezer Co. was becoming frustrated with the retail business as stores were closing and franchisees were unhappy. By 1955 Taylor had completely abandoned the concept and left the remaining franchisees to fend for themselves. In an attempt to boost sagging sales, John decided to add hamburgers to the Piedmont Road location. Also, during the winter months he began selling Christmas trees in the parking lots of the Zestos. This business eventually became known as Big John’s Christmas Trees. By 1955 there were five Zestos in operation: Peachtree Road, Ponce de Leon Avenue, Piedmont Road, Cheshire Bridge Road and Roswell Road. Then, in 1959 John opened a store in east Atlanta on Confederate Avenue. By this time all Zestos were serving food and had expanded the menu to include hot dogs, fried chicken and french fries. Also added in 1959 was a double decker hamburger called “Fat Boy”, as well as a “Foot Long” hot dog. 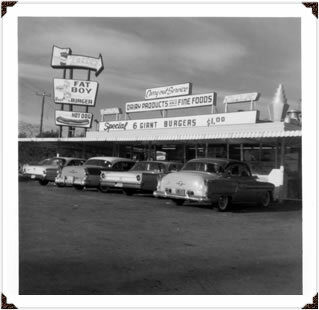 Unfortunately, in 1961, Big Boy Restaurants (Shoney’s) had learned of and did not appreciate the likeness that Fat Boy had to their own Big Boy hamburger, and threatened to sue Zesto. John decided to hold a contest to rename the Fat Boy. A student from Georgia Tech came up with the name “Chubby Decker” which was named with a then popular rock and roll singer, Chubby Checker, in mind. The name stuck and it is still the most popular food item at Zesto. 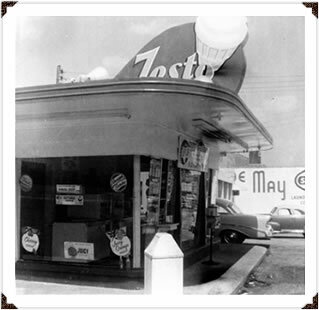 Still family owned and operated, we invite you to experience the Atlanta tradition that can only be had at Zesto. Whether you are coming back for your favorite “foot long” chili dog and home made onion rings or trying a Nut Brown Crown for the first time, we welcome you and hope you join the ranks of our life long customers! We’d be honored if you’d add a Zestimonial to our website and follow us on social media. We love seeing your photos! Thank you, Atlanta! Work at Zesto! Click here for more information!